The WENSIX Gaming High-Back Computer Chair combines a sleek design with great features and durable materials. While it is often used for long stretches of gaming, this chair also provides excellent support for those who need it for office work. Leisure and work often happen in the same types of seating for many of us. This is especially true if the same computer you use for work is also your gaming rig. This has given rise to gaming office chairs that combine ergonomic features with stylish design. 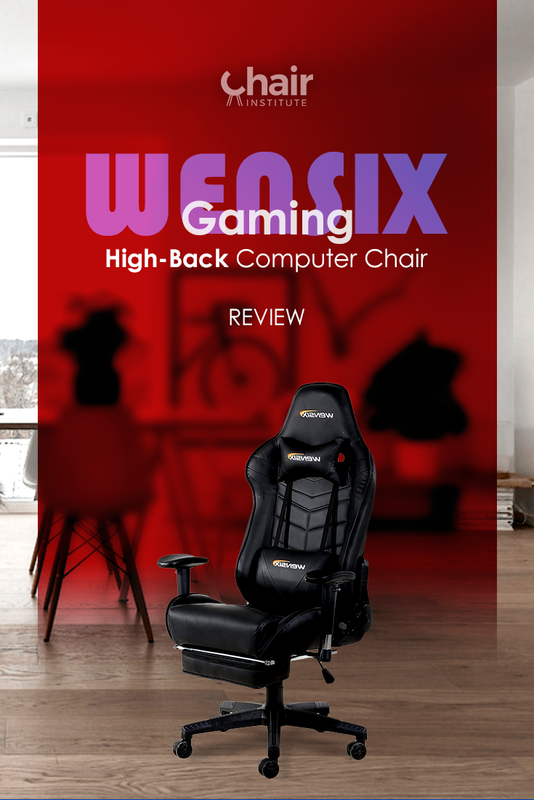 Our WENSIX Gaming High-Back Computer Chair review will show you if this is a strong contender. Join us as we look at this chair’s features, design, and any downsides it may or may not have. The WENSIX brand is a respected one on Amazon. The last year’s worth of reviews has been largely positive. This reflects the company’s stance on the highest standards of customer service. Much of the feedback mentions how well the customer service performed when they were needed. When approaching their office chair design, WENSIX follows the ergonomic design of racing car seats. This includes a high-back with a curved shape that cradles your back and maintains your posture. PU Leather upholstery also gives the chair a smooth surface that’s easy to clean as well. A selection of adjustable features and footrest rounds out the package. This is one of our top high-back office chairs under $200. It’s an impressive chair from a visual standpoint, but ultimately it will be the features and durability that decides how well it’s received. The backrest of the chair has a deep and curved design that hugs the curvature of your back. This is similar to the design of NASCAR racing seats, which require drivers to sit upright for a long period. This office chair includes a removable headrest pillow and padded armrests for additional comfort. The headrest can be flipped up and over the top of the chair if you do not want the extra padding. A convenient footrest is stored beneath the seat of the chair. It can be pulled out and flipped open for moments when you’re reclining in the seat. With the option to recline up to 180 degrees, this footrest is a welcome addition. A lumbar cushion at the base of the backrest gives you additional support and extended comfort for long periods of sitting. In addition to their excellent customer service, WENSIX also offers a 30-day money back guarantee. The WENSIX High-Back Gaming Office Chair comes in several color options. Gaming chairs like this one employ the same ergonomics as modern office chairs. For many people, a chair like this will be used for both work and play. With a strong and durable design, it’s no wonder that chairs like this have become so popular. Customers are overall very satisfied with the WENSIX Gaming Office Chair. As one of our top picks for an ergonomic office chair under $200, there’s a lot of value in this product. The cushions for the headrest and lumbar support have ample padding similar to memory foam. Setup and assembly are relatively simple, and customers always praise the customer support provided by WENSIX. Smooth PU leather upholstering is both comfortable and easy to clean. Adjustable height and armrests, combined with the 300-pound weight limit, also makes this chair a great choice for big and tall users. There aren’t many downsides to a chair like this, especially when considering the price point. Some users have said that the chair could feel more stable when sitting in it. Others have said that it makes noise when moving around, but neither of these issues has caused many problems with customers. The vast majority of WENSIX Gaming High-Back Computer Chair reviews are largely positive. This gaming office chair easily falls on our list of the best ergonomic office chairs under 200 dollars. We recommend it to anyone who wants a modern and stylish chair that performs well for both work and play. The Many Benefits Of Memory Foam Pillows, Nature's Sleep. Sit Up Straight. Your Back Thanks You, New York Times. Sitting in Reclined Position May Help Alleviate Back Pain, News-Medical. Lumbar Support for Office Chairs, Manage Back Pain. Qualities of a Good Gaming Chair, SBA Media Company.